The case study involves the Medium Altitude Reconnaissance System (MARS) deployed by the Royal Netherlands Air Force on the F-16 aircraft. The system employs two cameras to capture high-resolution images. 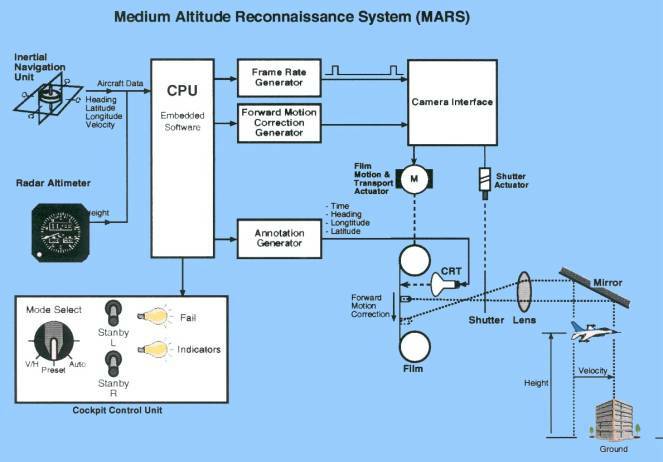 The MARS counteracts the image quality degradation caused by the forward motion of an aircraft by creating a compensating motion of the film during the film exposure. The controls applied to the camera for the film speed of the Forward Motion Compensation (FMC) and the Frame Rate are being computed real-time based on the current aircraft altitude, ground speed, and some additional parameters. The system is also responsible for producing the frame annotation containing time and the aircraft�s current position, which must be synchronised with the film motion. The system also performs health monitoring and alarm processing functions. In order to perform the camera and film-exposure control functions system acquires the current altitude and velocity data from the avionics data bus of the aircraft. Based on these values it computes the film Frame Rate to be used and the value for the Forward Motion Compensation (FMC) signal. The computed values are sent to the Trigger & Exposure Module via a serial link. When pilot depresses the camera trigger button, the Trigger & Exposure Module generates the trigger pulses (with the computed Frame Rate) and applies the computed FMC signal to the film transport control of the camera. In order to perform the film annotation functions system acquires the current navigation data (latitude, longitude and heading) as well as time-of-day value from the avionics data bus of the aircraft. It formats the data and sends it to the Annotation Module via the serial link. After the completion of each frame exposure cycle the camera halts the film and issues an annotation request to the Annotation Module. Upon reception of this request the Annotation Module provides the current annotation data to the camera via a serial link. After the reception of the annotation data the camera annotates current frame. The annotation cycle must be completed before the next frame exposure cycle begins. In order to perform the system health monitoring and alarm processing functions system processes the operational status of the various MARS components (e.g. camera status, serial communication status, data bus status, statuses of the hardware modules, etc.) and generates pilot alarms according to the alarm processing logic. � Hard timing requirements on the data acquisition and processing time in order to accommodate the data rate of the avionics data bus. � Control Panel commands processing. High-level data processing activities and data transfer to the external control modules. The model is time-driven and contains some timing constraints specifications derived from the requirements. Below are examples of the case study LSC model. Next to the LSC modelling several verification experiments have been performed on the developed model using the model verification facility provided by the PlayEngine tool, which makes use of the SMV model checker. Below are some property LSC specifications used in the verification experiments. 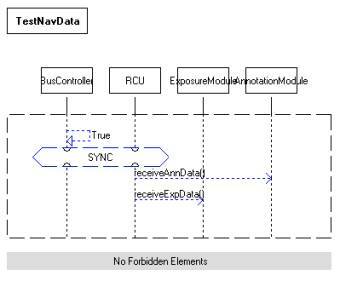 Untimed UML modelling is performed with the use of Rhapsody tool from I-Logix. For the purpose of untimed verification experiments the UML Verification Environment (UVE) tool from OFFIS is being applied to the data acquisition part of the MARS model. The UVE tool provides facilities for untimed model checking of UML models. Property specification in the UVE tool is based on propositional logic and temporal logic patterns. The case study model is event-driven with non-deterministic external event trace being used to drive the behaviour of the environment. To provide for environment�s liveness and to restrict its full non-determinism the temporal logic-based assumptions are used. Some examples of the case study UML modelling are given below. UVE tool provides a synchronous view on the system. A system run is seen in terms of run-to-completion steps representing a sequence of system configurations. Execution traces generated by the tool are represented in the form of discrete-time timing diagrams. The tool�s built-in temporal logic patterns use the discrete-time quantifications in terms of run-to-completion steps in order to express the bounded property specification, e.g. �if P then eventually Q within X steps�. The verification experiments made extensive use of this style of property specification in order to more closely relate the untimed verifications to the timed ones performed with the other OMEGA tools. An example shown below is one of the series of verification experiments performed in the case study. Property: If the DatabusController becomes henceforth not operational then eventually the MessageReceiver will be in the ControllerError state. 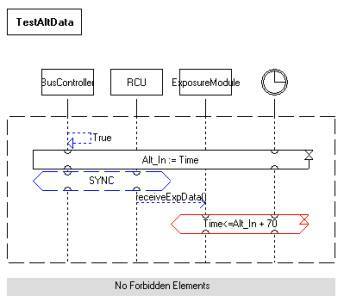 UML modelling for timed verification experiments is performed with the use of Rhapsody tool from I-Logix. Modelling of the timing is performed with the use of OMEGA time extensions. For the purpose of the timed verification experiments the same part of the UML model of the MARS case study has been taken as for the untimed verification experiments with the UVE tool. For the timed verification experiments the IFx tool from VERIMAG is used. The IFx tool provides facilities for timed model checking, making use of the OMEGA time extensions, as well as model simulation. Property specification in the IFx tool is based on observers. The case study model is event- and time-driven with explicit timed modeling of the environment, which exhibits non-deterministic behaviour. Some examples of the case study UML modelling are given below. The IFx toolset from VERIMAG provides facilities for use of the OMEGA time extensions in UML models, allowing simulation of the timed models and verification of, among others, timed properties. Properties to be verified are expressed in terms of observers, which are defined in the form of specialised statecharts within the dedicated <<Observer>> classes. 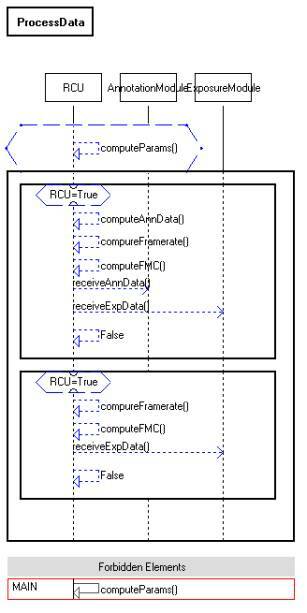 The error traces generated during the verification process are used as system execution scenarios by the IFx simulator for the model debugging purposes. Series of verification experiments are performed for the specified properties. Below are several observer specifications used for the verification of the corresponding properties. Property 1: If the DatabusController becomes non-operational at time T and stays non-operational for more than 10 ms then the MessageReceiver shall enter the state ControllerError by the time T+10 ms at the latest. Property 4: If the MessageReceiver is in the BusError state and both the AltDataSource and the NavDataSource send successfully their data during the 2 consecutive cycles, then the MessageReceiver will be at Operational state at most 5 ms after the last of these messages has been sent. Property 5: The MessageReceiver shall not enter the Operational state unless 2 previous attempts of both data sources to transmit message have been successful. Compositional approach has been adopted for specification of the Property 4 / Property 5 observer.